This article is about the men's team. For the women's team, see Faroe Islands women's national football team. Faroe Islands playing against Italy on 2 September 2011. The match ended in a 1–0 defeat. From 1930 to 1988, before international membership, the Faroe Islands only played national friendly matches against Iceland, Shetland, Orkney Islands, Greenland and Denmark U-21. None of these fixtures were considered official either by FIFA, nor the Faroe Islands Football Association. The Faroe Islands are the most successful team of the friendly tournament known as the Greenland Cup, with two cup victories in 1983 and 1984. The Faroe Islands gained membership of FIFA on 2 July 1988 and joined UEFA on 18 April 1990. The first official victory was a 1–0 win, in a friendly against Canada in 1989. Faroe Islands participated in two Island Games, winning both tournaments in 1989 and 1991. They never entered the tournament again, as the opponent teams were considered too weak a match for the Faroese side. Faroe Islands pulled one of the biggest upsets in footballing history when they beat Austria 1–0 in their first ever competitive international on 12 September 1990. The game, a Euro 92 qualifier, was played in Landskrona, Sweden, because there were no grass pitches on the Islands. Torkil Nielsen, a salesman for his local builders company scored the goal. 32 year old national coach Páll Guðlaugsson became a folk hero overnight, and is today remembered by his players as a fearless character, who always believed that the Faroe Islands could get a result against the bigger nations. In his self-biography, national goalkeeper Jens Martin Knudsen revealed that Guðlaugsson held a stunning pre-match speech, that boosted the players confidence prior to the match against the Austrians. Guðlaugsson pre-match speech goes; "Think of the Faroese flag. Your flag. Take it with you on that field. Throw yourself into the tackles against those arrogant Austrians with one mission – to win the game for your nation. Tonight you pay back your childhood home. You have the opportunity now and it is an irreparable blow if you don't seize it!" The win was against all odds and to this day, this is the story about Faroese football – and the story about sports in the Faroe Islands. American sports magazine Soccerphile rated the Faroese victory number 10 of all-time football greatest upsets. One month later the Faroe Islands lost 4–1 to Denmark at Parken, Copenhagen. The same team got another good result in the qualifying tournament, when they drew 1–1 against Northern Ireland at Windsor Park on 1 May 1991. The Faroe Islands lost the remaining five matches of the tournament. Since Landskrona, Faroese football stepped up to the challenge, regurlarly getting good results against better teams. However, it was a surprise to many around Europe when Allan Simonsen in 1994 was appointed the new coach for the Faroese national team. Having had a playing career in Borussia Mönchengladbach and F.C. Barcelona, many thought that the European footballer of the year in 1977, was too big a name for such a small nation. Allan Simonsen was in charge of the Faroese team for seven years, and is still today considered as the coach who lifted the Faroese amateurs to a more professional level. Among other things he asked the Football Association to lengthen the season, and also asked the clubs for fitter players. Of which both were granted, and are today considered an essential part if the Faroese national team is to compete at the highest level. Under the guidance of Allan Simonsen the Faroe Islands won two Euro 1996 qualifiers matches against San Marino; 3–0 and 3–1, and two 1998 World Cup Qualifying matches against Malta; both ended 2–1, and two 2002 World Cup Qualifying matches against Luxembourg; 2–0 and 1–0. They played three draws against Lithuania; 0–0, Scotland; 1–1 and Bosnia; 2–2, all in the Euro 2000 qualifiers, and also draw against Slovenia; 2–2 in the 2002 World Cup Qualifying, which turned out to be their most successful World Cup qualifying until 2018. In 2002, former Danish international Henrik Larsen, succeeded his countryman, Allan Simonsen, as head coach of the Faroe Islands national team. It was important for the Football Association to get a well known and respected name in Europe, and got what they wanted in Larsen, who won the UEFA Euro 1992 with Denmark as a player. On 7 September 2002 in their first match together, an experienced Faroese team played Scotland at home in a Euro 2004 qualifier. The game ended 2–2, after the Faroe Islands had been leading 2–0 at halftime. In the same qualifying tournament, Faroe Islands almost caused a big upset against Germany in HDI-Arena in Hannover on 16 October 2002. Unfortunately for the Faroes, the post denied them a draw in the dying seconds of the match, the game ended 2–1 to the German side. However, they managed one more draw against Cyprus on 9 October 2004 in the 2006 World Cup Qualifying. In 2006, the Faroe Islands got their first Faroese coach. Jógvan Martin Olsen from Toftir had been the assistant coach for the Faroese national team for nine years upon appointment. Many experienced players who had been regulars in the national squad for years, quit the national team at the same time. Olsen main task was to build a new team with a new generation of players. This affected the results, and the Faroe Islands got zero points in the Euro 2008 qualifier, their first qualification under Olsen as coach. 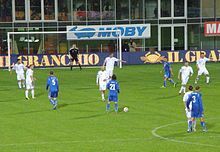 However, On 2 June 2007, against Italy, the Faroes surprisingly took the sluggish world champions to the limit after netting a 77th-minute goal in a 2–1 loss. Overall, their Euro 2008 qualifying campaign was disastrous, as they conceded 43 goals and scored only four (all of which were scored by the same player, Rógvi Jacobsen, and half of which were against Italy en route to losing all twelve matches, of which three of them were 6–0 defeats. During the summer of 2008 the Faroese side played two friendlies. First they lost 4–3 to Estonia on 1 June 2008, and this match has been credited as the only official international in which the Faroe Islands scored 3 goals and lost. Later they lost 5–0 to Portugal. Olsen remained as coach for the first four qualification matches in the 2010 World Cup Qualifying and after announcing the squad against the Austrian national team, Olsen announced that he was to step down after three years in charge. On 11 October 2008 he managed to get a big result, as the Faroe Islands once again became the Austrian nightmare. The game ended 1–1, giving the Faroe Islands their first qualifying point in four years. On 22 March 2009, the Faroese people got a glimpse of their future national team, a new generation of more technical and paceful players beat the Icelandic national team 2–1 in a friendly match, their first ever victory over Iceland. Caretaker Heðin Askham managed the Faroese side in this match. On 5 April 2009 former Republic of Ireland manager Brian Kerr was appointed new manager of the team. With his charisma and Irish humour, he soon became a favourite among the Faroese football fans. On 9 September 2009, Faroe Islands recorded their first competitive win since the 2002 World Cup qualification stage after beating Lithuania 2–1. On 11 August 2010, the Faroe Islands came close to an away win in Estonia during the UEFA Euro 2012 qualifiers. The Faroes took the lead in the first half with a goal by Jóan Símun Edmundsson. The score was still 1–0 after 90 minutes played, but Estonia scored twice during stoppage time and Faroe Islands lost the match 2–1. Two months later, on 12 October 2010, the Faroe Islands drew 1–1 with the higher ranked Northern Ireland at the Svangaskarð Stadion, Toftir. Striker Christian Holst scored for the Faroes in the 60th minute, before Kyle Lafferty equalised 16 minutes later for the visiting side, earning a point for both teams. On 7 June 2011, the Faroe Islands defeated Estonia 2–0 at Svangaskarð. Captain Fróði Benjaminsen opened the scoring from the penalty spot in the 43rd minute, before Arnbjørn Hansen then secured the win with a follow up after another Benjaminsen penalty. It was the Faroe Islands' first UEFA Euro qualification win since 1995. Faroe Islands were drawn against Kerr's former employers, the Republic of Ireland, in Group C for the 2014 World Cup Qualifying. The other teams in the group were Germany, Sweden, Austria, and Kazakhstan. On 26 October 2011 Brian Kerr stepped down as coach of the Faroe Islands national team, after the Faroe Islands Football Association (FSF) announced that "it was not possible to agree a new contract with Brian Kerr". The players liked the Irishman and they described him as a very motivating figure. His pre-match speeches were full of passion and gave the players confidence to go out and play against the very best in Europe. Faroe Islands defeated Greece 2-1 on 13 June 2015. On 8 November 2011 the Faroese Football Association announced that an agreement had been reached with the 50-year-old former Denmark captain and European Champion from 1992, Lars Olsen, to become the next coach of the Faroe Islands. Lars Olsen is the third Dane to coach the Faroe Islands after Allan Simonsen and Henrik Larsen. On 1 March 2014, for the first time in the Faroe Islands' history, they scored four goals in a match. In what was only Gibraltar's second match as an official UEFA member, the hosts lost their first ever home match by the score of 1–4. Faroe midfielder Christian Holst scored twice. On 11 October 2013, Olsen got his first point in a 1–1 draw against Kazakhstan. On 14 November 2014, the Faroe Islands caused a major international football upset by defeating hosts Greece 0–1 during the Euro 2016 qualifiers. The Guardian reckoned the win as the biggest upset ever in terms of FIFA Rankings; Greece were ranked 18th, the Faroe Islands 187th, a 169-place difference. On 13 June 2015, the Faroe Islands stunned the world yet again by defeating the same Greek side in their second meeting of the Euro 2016 qualifying tournament by a score of 2–1. These two wins saw the national team moving from 187th place to 74th place in the FIFA rankings. The team eventually finished 5th of their group with 6 points, and never conceding more than three goals in a match. On 29 March 2016, the Faroe Islands beat Liechtenstein 3–2 in a friendly match in Marbella, Spain. The opposition had two late equalizers in stoppage time, however this recorded Faroe Islands fourth victory over Liechtenstein since 2000. On 6 September 2016, the Faroe Islands draw 0–0 against Hungary in a 2018 World Cup Qualifying match at Tórsvøllur. On 10 October 2016, the Faroe Islands defeated Latvia 2–0 in a 2018 World Cup Qualifying match. On 3 September 2017, the Faroe Islands defeated Andorra 1–0 in a 2018 World Cup Qualifying match on home soil, beating their own record which was 7 points in a EURO or World Cup qualification; after the victory over Andorra the Faroe Islands reached a record 8 points in the 2018 World Cup Qualification after playing eight of ten matches. As of 26 September 2017, the Faroese national team has twelve full-time professionals playing in Norwegian, Danish and Icelandic leagues, compared to the 1990 team who won the Austria game in Landskrona, which was entirely made up of amateurs. Between 1999 and 2011, the Faroe Islands played its home matches on two different stadiums, rotation wise on Tórsvøllur and Svangaskarð. Their latest match on Svangaskarð was a 2–0 victory in a UEFA Euro 2012 qualifying match over Estonia on 7 June 2011. Since then a comprehensive renovation has taken place in between matches on Tórsvøllur, which has transformed the stadium in to a multifunctional venue for concerts and sports in general. Although, international football being the primarily one. Flood lights were introduced in 2011, and 6000 new seats under roof have been installed, the surface has been replaced with artificial grass and the stadium now meets all UEFA and FIFA demands. Source:Updated as of 25 March 2018 after the game against Liechtenstein. Lars Olsen, manager of the Faroe Islands national football team. Skansin, Faroese football supporters at the Faroe Islands vs Greece match at Tórsvøllur 2015. Faroe Islands have a main stand for their supporters at Tórsvøllur, which is known as "Skansin", meaning fort in English. Skansin was formed in 2014, following their 1–0 away victory against Greece in Pireaus and the opening of their newly renovated stadium. As of April 2016, Skansin has 400 members domestically, and stand tickets are sold out every home match. Following Northern Ireland's 3–1 victory against Faroe Islands during the Euro 2016 qualifiers on 4 September 2015, Northern Ireland forward Kyle Lafferty stated that he was particularly impressed with the Faroese supporters, as they cheered for their players throughout the entire match, even when the Faroes threw away a likely 1–1 result. Drums and trumpets are an essential part of their support. Source: The following players were called up for the UEFA Euro 2020 qualifying matches against Malta and Romania on 23 and 26 March 2019 respectively. (1989-03-30) 30 March 1989 (age 30) 6 0 Free agent v.
^ "Member Association - Faroe Islands". FIFA.com. Retrieved 2018-08-19. ^ Courtney, Barrie (16 May 2008). "Faroe Islands – List of International Matches". RSSSF. Retrieved 3 November 2010. ^ "Faroe Islands - List of International Matches". www.rsssf.com. Retrieved 2018-08-19. ^ "Greenland Cups 1980-84". www.rsssf.com. Retrieved 2018-08-19. ^ "Faroe Islands at UEFA.com". UEFA. ^ "Føroyar – Eysturríki 1–0" (in Faroese). FSF. Retrieved 14 September 2013. ^ "The Faroe Islands National Team". fsf.fo. Retrieved 10 March 2017. ^ a b c d "National Coaches". fsf.fo. Retrieved 10 March 2017. ^ "Football's 20 Greatest Upsets - Soccerphile". soccerphile.com. Retrieved 10 March 2017. ^ "Kerr takes on Faroe Islands post". BBC Sport. 2009-04-06. Retrieved 2009-04-06. ^ "Eight years of hurt ends". ESPN. 2009-09-09. Retrieved 2009-11-17. ^ "Brian Kerr steps down as coach for the Faroese National Team". UEFA.com. 2011-10-26. Retrieved 2011-10-26. ^ "Lars Olsen becomes coach of the Faroe Islands". UEFA.com. 2011-11-08. Retrieved 2011-11-08. ^ "The Faroes stun Greece with brilliant away win". UEFA. 14 November 2014. ^ "HISTÓRICO! Ilhas Faroe vence Grécia fora de casa" (in Portuguese). Faroe Football. 14 November 2014. ^ "Is the Faroe Islands' win over Greece the biggest shock of all time?". The Guardian. 14 November 2014. Retrieved 27 May 2015. ^ Agencies (13 June 2015). "Faroes humiliate Greece by sealing double in Euro 2016 qualifying". Retrieved 10 March 2017 – via The Guardian. ^ UEFA.com. "UEFA EURO 2016 - Matches - UEFA.com". uefa.com. Retrieved 10 March 2017. ^ "Føroyar fingu fyri fjórðu ferð fult ímóti Liktinstein". in.fo. Retrieved 10 March 2017. ^ "Latvia v Faroe Islands". 7 October 2016. Retrieved 10 March 2017 – via www.bbc.co.uk. ^ "Fantastiskur sigur á Andorra" (in Faroese). Faroese Football Association. 3 September 2017. Retrieved 5 September 2017. ^ uefa.com (7 June 2011). "UEFA EURO 2012 - History - Faroe Islands-Estonia – UEFA.com". uefa.com. Retrieved 10 March 2017. ^ "Útbygging: Seta spakan í". fsf.fo. Retrieved 10 March 2017. ^ FIFA.com. "The FIFA/Coca-Cola World Ranking - Associations - Faroe Islands - Men's - FIFA.com". fifa.com. Retrieved 10 March 2017. ^ "Menn A". fsf.fo. Retrieved 10 March 2017. ^ "Venjarar og leiðarar". fsf.fo. Retrieved 10 March 2017. ^ (www.knassar.com), Knassar - the new media web partner. "Norðurírar vunnu 3-1 á Tórsvølli - Føroyski portalurin - portal.fo". portal.fo. Retrieved 10 March 2017. ^ a b c d "Landsliðsleikarar 1988 - 2018". www.fsf.fo. Retrieved 8 September 2018. ^ "Jóannes Bjartalíð er nýggjur á landsliðnum". in.fo. Retrieved 8 September 2018. ^ "Landsliðið úttikið: Týðandi spælarar mangla". in.fo. Retrieved 8 September 2018. ^ a b "Móti Lettlandi og Liktinstein í mars" (in Faroese). FSF. 19 December 2017. Retrieved 26 December 2017. ^ Manaschev, Erlan (2 February 2005). "International Matches 1990 – Europe, July–December". Rec.Sport.Soccer Statistics Foundation. Retrieved 26 June 2011. ^ Morrison, Neil; Cazal, Jean-Michel (2 February 2005). "International Matches 1991 – Europe, January–June". Rec.Sport.Soccer Statistics Foundation. Retrieved 26 June 2011. ^ Gerrard, Russell (2 February 2005). "International Matches 1995 – Europe, April–June". Rec.Sport.Soccer Statistics Foundation. Retrieved 4 July 2011. ^ Morrison, Neil (2 February 2005). "International Matches 1995 – Europe, October–December". Rec.Sport.Soccer Statistics Foundation. Retrieved 4 July 2011. ^ a b Kutschera, Ambrosius (2 February 2005). "International Matches 1997 – Europe, January–June". Rec.Sport.Soccer Statistics Foundation. Retrieved 4 July 2011. ^ Kutschera, Ambrosius (2 February 2005). "International Matches 1998 – Europe, July–December". Rec.Sport.Soccer Statistics Foundation. Retrieved 4 July 2011. ^ a b Kutschera, Ambrosius (2 February 2005). "International Matches 1999 – Europe, January–September". Rec.Sport.Soccer Statistics Foundation. Retrieved 4 July 2011. ^ Owsiański, Jarosław (2 February 2005). "International Matches 2000 – Europe, July–September". Rec.Sport.Soccer Statistics Foundation. Retrieved 9 July 2011. ^ a b Kutschera, Ambrosius (2 February 2005). "International Matches 2001 – Europe, January–June". Rec.Sport.Soccer Statistics Foundation. Retrieved 12 July 2011. ^ Manaschev, Erlan (2 February 2005). "International Matches 2001 – Europe, July–December". Rec.Sport.Soccer Statistics Foundation. Retrieved 12 July 2011. ^ Kutschera, Ambrosius (2 February 2005). "International Matches 2002 – Europe, July–December". Rec.Sport.Soccer Statistics Foundation. Retrieved 12 July 2011. ^ "2006 FIFA World Cup Germany ™ Preliminaries". FIFA. Archived from the original on 12 January 2014. Retrieved 13 September 2012. ^ a b "Faroe Islands – Fixtures and results". FIFA. Retrieved 13 July 2011. ^ a b "European Championship Qualification – 2012 Poland/Ukraine". Soccerway. Global Sports Media. Retrieved 13 September 2012. Wikimedia Commons has media related to Faroe Islands national football team.